The metro Phoenix area has so much to offer. Besides great homes and great workplaces, the Phoenix area offers pleasant, sunny weather and a wealth of entertainment and relaxation options. Whether you prefer historic homes in trendy downtown Phoenix, the opulence of a Scottsdale mansion, or a suburban home in a family friendly community, there is a perfect location here for you. Learn more about the major cities we serve by visiting our communities resources pages. We are area experts and ready to help you through every step of your move. Anthem, Arizona: Established in 1999 by Del Webb, Anthem is approximately 34 miles north of downtown Phoenix and offers some of the best amenities in a master-planned community. Cave Creek, Arizona The charming, yet rustic town of Cave Creek, Arizona lies in the foothills of Black Mountain, Skull Mesa and Elephant Butte. Chandler, Arizona: Chandler is home to just over 240,000 residents and known as a high-tech industrial city. 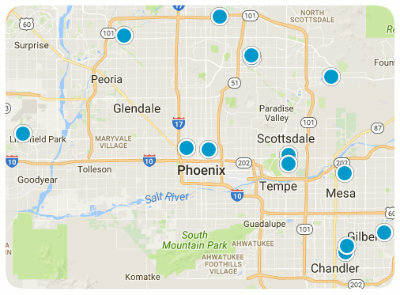 Some of the largest employers in Chandler are technology based companies. Gilbert, Arizona: Gilbert, Arizona is located southeast of downtown Phoenix and spans across seventy-six square miles. Once known as the “Hay Shipping Capital of the World,” Gilbert has shifted from an agricultural community to a diverse city that has grown from just under 6,000 population in the 80s to over 208,000 as of the 2010 census. Glendale, Arizona: Located nine miles from downtown Phoenix is the blustering community known as Glendale, Arizona. Home of the 2008 and 2015 Super Bowl games, Glendale is the hub for the nightlife in the West Valley. Goodyear, Arizona: Established in 1917, Goodyear was named after the purchase of 16,000 acres by the Goodyear Tire and Rubber Company, who wanted to use the land to grow cotton for tire tread. Goodyear became a town on November 19, 1946 and today is home to more than 72,000 residents. Mesa, Arizona: Located about twenty miles from downtown Phoenix, Mesa is the third largest city in Arizona. According to the 2010 census, there were reported to be just over 439,000 residents in Mesa. Some of the history in Mesadates back as far as 2,000 years ago when the Hohokam people roamed the desert. They are largely responsible for the development of the original canal system that brought water for agricultural. Peoria, Arizona: Peoria is the sixth largest city in Arizona by land size and the ninth largest by population. In 2008, Peoria was ranked “Top 100 Places to Live” by Money Magazine. To learn more about the city of Peoria, click here. Phoenix, Arizona: Known as the “Valley of the Sun” Phoenix is the capital of Arizona with a population of 1.5 million according to the 2010 census. Phoenix is the largest state capital city in the United States and the sixth most populous city in the nation. Scottsdale, Arizona: Scottsdale has a population of just under 227,000 residents and has been described as “a desert version of Miami’s South Best” by the New York Times. If you are looking for nightlife, fine dining and designer name brands, nestled against a rugged mountain backdrop, then Scottsdale, Arizona is where you want to be. Sun City, Arizona: Known as the “City of Volunteers” Sun City is known for its community involvement and active volunteers. Sun City, Arizona is unincorporated town just northwest of downtown Phoenix. With a population just shy of 40,000 residences, Sun City has been a favorite destination for retirees since the 1960s. Sun City West, Arizona: In 1978 Del Webb Corporation started the second retirement community in Arizona, known as Sun City West. Twenty years later, Sun City West had attracted over 30,000 residents from all across the globe. Today, Sun City West encompasses eleven square miles and has a population just under 25,000. Surprise, Arizona: Recorded documents tell us that a woman named Flora Mae Statler was the purchaser of land in Surprise, dating back to 1938. With the development of Grand Avenue, which runs right through Surprise, and proximity to the Santa Fe railroad, Statler subdivided land for inexpensive housing for agricultural workers. Statler’s daughter said that her mother named the area Surprise because she would be “surprised if the town ever amounted to much.” Flora Mae Statler would be very surprised, as today Surprise has been reported as the second largest city in the Valley of the Sun. Tempe, Arizona: Tempe is best known as the home to the Arizona Sun Devils. Arizona State University dates back to 1885 when the thirteenth Arizona Territorial Legislature choseTempe as the site for the college. Located just east of downtown Phoenix, Tempe has over 161,000 residents according to the 2010 census.